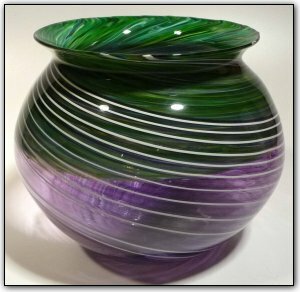 This incalmo bowl was made from hand pulled canes and features the lovely color combination of green and purple along with white highlights. Working with cane is a two stage time consuming process, first Dirwood hand pulled the canes used to make this bowl then he made the bowl with those canes using the incalmo method. Incalmo is an extremely complex technique where each section is made separately and then they are joined one at a time while the glass is still hot. Everything about this bowl, from the colors to the form, are nothing short of perfection.